Fall Color: Brilliant yellow / red. 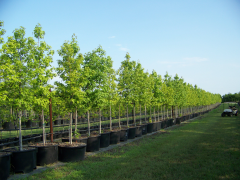 Comments: Cherokee® Sweetgum is a deciduous tree with a narrow, pyramidal growth habit. Unusual corky bark and excellent fall colors make this a very popular tree. Leaves are glossy green in summer changing to multiple colors of yellow orange and finally deep red in fall. This variety has been reported to withstand temperatures of 28 degrees below zero without damage. Very light production of seed (gum balls), according to the founder Earl Cully also founder of Heritage® Birch.